Alloys of Zinc have two uses: one is for castings, another is for wrought applications. 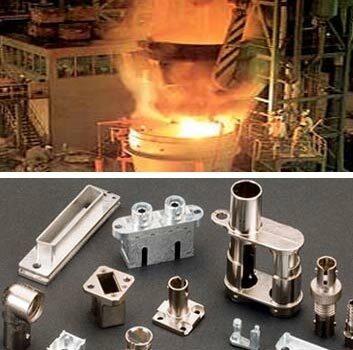 Zinc Casting process is carried out in two sub-processes, namely die casting and gravity casting. We are manufacturers and suppliers of zinc castings and zinc alloy casting. Usually, the zinc die casting process uses three alloys of zinc, i.e. alloy 3, alloy 5 and alloy 7. We use mainly these alloys of zinc, because these alloys have good ductile and malleability properties. We generally use these alloys for plated and highly decorative areas, because of its excellent finishing characteristics. We are well recognized for our excellent zinc castings and zinc alloy casting. We have well infrastructural facilities and expert human resources for carrying out zinc casting process.